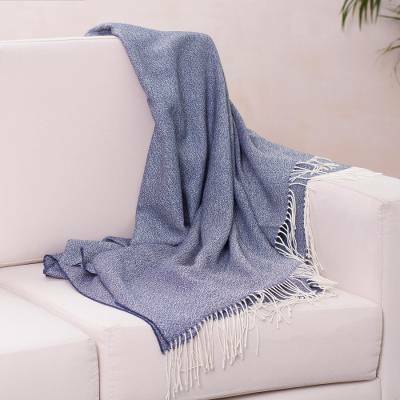 Woven of baby alpaca wool, this soft, cozy throw blanket is is the work of Felipe Berckholtz. The Peruvian artisan gives the throw a speckled pattern in indigo blue and eggshell white for a homey addition to any room. Baby alpaca refers to the fine fleece from the season's first shearing. You can find 100% baby alpaca throw 'Indigo Love' by Felipe Berckholtz in pillows & throws categories such as College Dorm Blankets and Throws, Alpaca Blankets and Throws and Alpaca Wool Blankets and Throws. Enjoy exploring these sections for other Novica treasures.